FREE online Living History Publication. This publication is FREE online, and it contains articles, and a world wide listing of groups and traders. Small-sword vs Tomahawk & Longknife demo video. Great Lakes Area Woodland Indians. Video. Black Watch Tomahawk Fighting. Video. 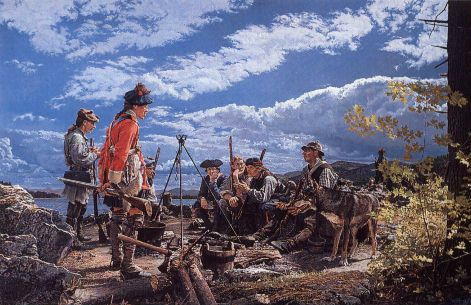 18th Century Historical Trekking. What Do We Get Out Of It? 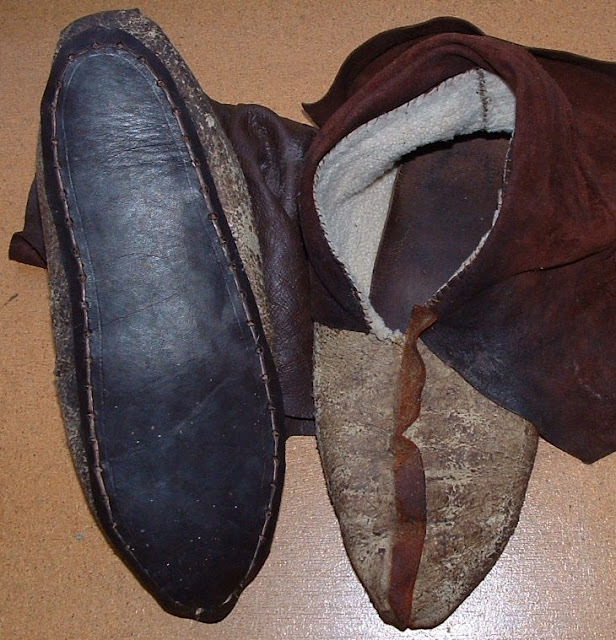 Someone asked me recently how did I manage wearing sheepskin moccasins. What happens when I am in swampy ground and they get wet, do I have to turn them inside out to clean them? My answer was that I simply dry them slowly by the fire, and if there is no fire then they stay wet. “It was on the first of May, in the year 1769, that I resigned my domestic happiness for a time, and left my family and peaceable habitation on the Yadkin River, in North-Carolina, to wander through the wilderness of America, in quest of the country of Kentucke, in company with John Finley, John Stewart, Joseph Holden, James Monay, and William Cool”. The key words here are “resigned my domestic happiness”, that means that Boone knew that his time in the woods, no matter how much he loved it and was contented with it, was not going to have the comforts of home. You have to be as realistic as you can if you wish to experience that 18th century lifestyle. Let us just for a moment place ourselves on the trail in the forest 300 years ago, what are we thinking? What are we doing? When I go on a historical trek, I am aware of the dangers that existed back then, wild animals and perhaps unfriendly Indians. I walk as quietly as I can, and every now and then I stop and listen. On this particular trek I am working as a Ranger for a community. 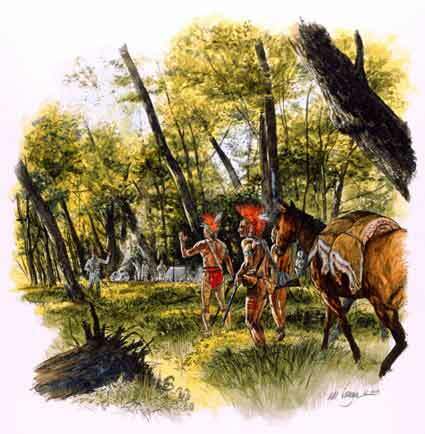 They have had trouble with raiding Indians and before the militia can muster, the raiding parties have disappeared back into the forest. My job is to look for sign, and if I find sign that there are Indians in the area, then I have to try and get back to the community and warn them. When I make camp at night I will simply lay on the ground with no shelter unless rain or snow threatens. I may make a bed of fern, but that is all. I will not light a fire for fear of being seen, so I will find a place out of the wind, perhaps a place with natural shelter. My food must be eaten cold, for that purpose I have brought along some cooked meat, cheese and bread. I also have some dried food stuffs in my pack just in case. I can not tell how long I will be out. This Ranging is a hit and miss venture at best. I could be in the wrong place at the wrong time, and the enemy may slip past me without either of us knowing the other’s presence. But I must try, I must think of the various possibilities regarding where they may be coming from and which trail they may take. It is Autumn, an Indian summer. The leaves are still on the trees and bushes, enough to give the Indians cover. One last raid before winter? Could be. It is getting chilly at night now, I have been out for a week and my cold rations are gone. Now I eat a little oats in cold water. It tastes good on a cold night. This is comfort, I have a good blanket and dry clothes. I have a spare woollen shirt and weskit rolled up in my blanket that I can put on over my other under clothes and under my frock if I get cold. One time when a friend and I were on the Great Lakes in winter, our boat got swamped by a sudden storm. We were still a good 100 yards from shore, and had to get into the water and swim our boat to shore. The wind still blew a gale, and the rain hammered down. Whilst my friend unloaded the boat as fast as he could to minimise the damage to our supplies, I got a fire going and started to construct a shelter frame. Then we both finished the shelter together, I got my oilcloth over the frame and tied down, and my friend used the boat sail to give us more cover. We stripped off our wet clothes and hung them over a rope to dry in front of the fire. I had made the fire large, so we could get warm fast and dry our clothes. We sat in our breechclouts, blankets and wool caps passing the port and watching our clothes steam. It was one of the best times I have ever had. Australia wide survey on Living History. 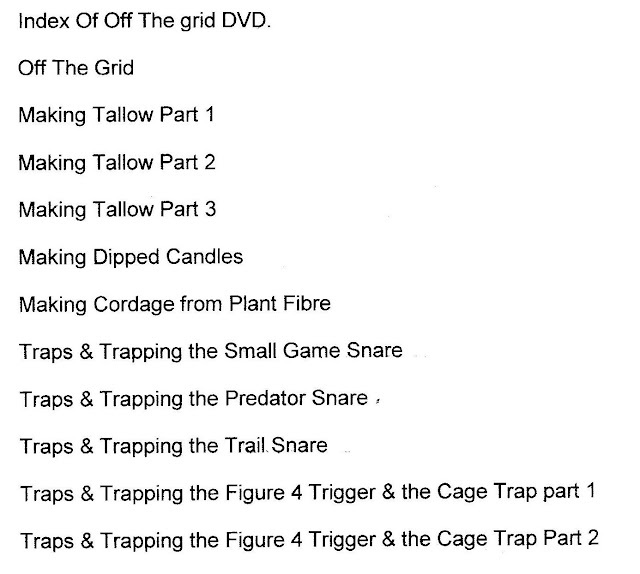 I have had many requests to produce an Off The Grid video/DVD. As I have lived off the grid for over 30 years this was not hard to do. 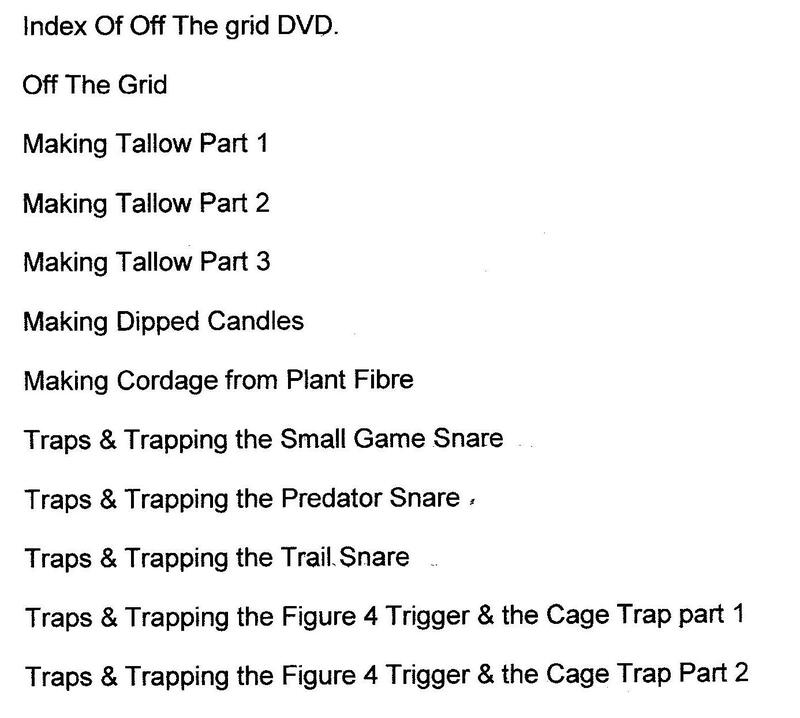 So the Off The Grid DVD will be available soon, & I will advertise it on this blog when it is ready for sale. The video itself plus 10 other videos that will be on this DVD are already completed. All I have to do now is send a hard copy off to my agents & await confirmation that it is ready to go. 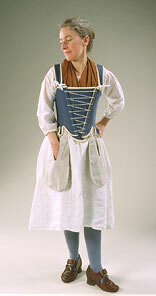 Women's Clothing from 1700-A Link. my middle, and Each End made fast to my Companions,”. Mid-18th Century Foods in France, As Seen by Smollett. A Link. 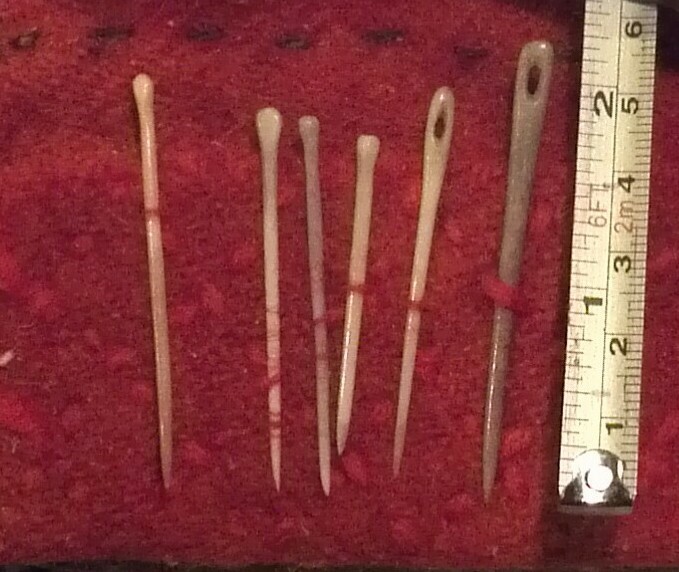 Handmade Antler Pins & Needles By Yooper. Yooper is one of our group members in America, and he makes a lot of his own gear. Below is an image of part of Yooper's sewing kit, showing the antler needles and pins he made himself. I think there is something very special in producing something practicle like this and actually being able to carry it with you and use it when needed. I think these pins and needles are a work of art, beautiful. nalbinding (needle binding) By yooper on our forum. This post by one of our forum group members. 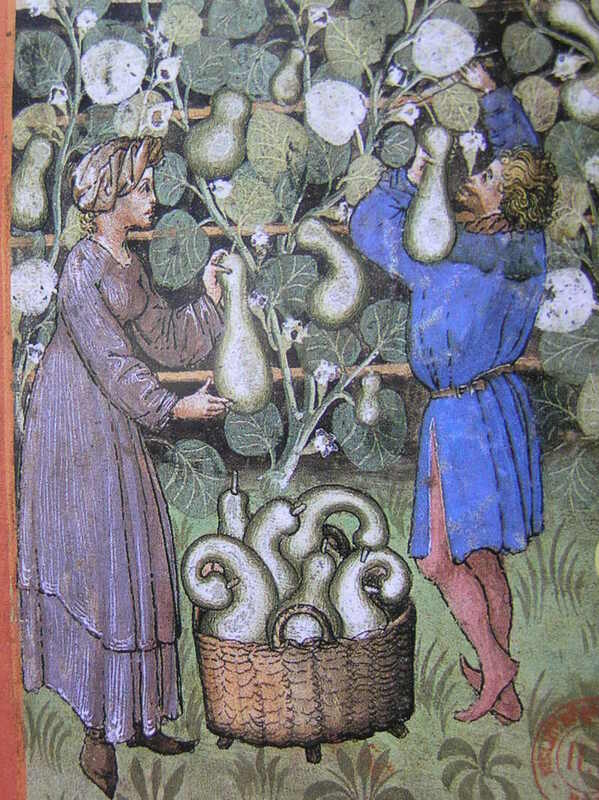 QUICK RESEARCH II - BOTTLE GOURDS & TEA. A Link. I found this article to be a very interesting read, well worth checking out. Sara seems to be covering more of the 17th and 18th century of late. Quotes from the Diary of John Bartram. till juft over our heads, and it began to fall. before us and fell faft afleep. down once more, I flept found all night. John Bartram 1743. Travells from Pennsylvania to Canada. Making the Australian Bark Canoe. A New Blog. Check it out. Orthodox Candles is all about candles and candle making. 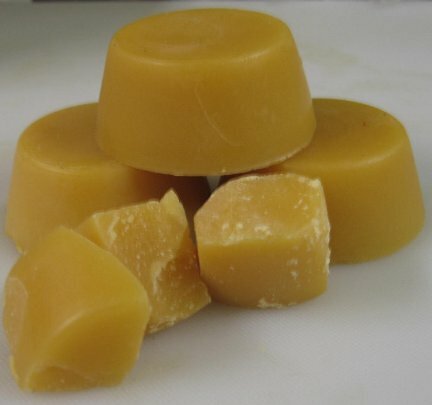 Well worth checking out if you have an interest in making your own candles. French & Indian War Game. Something to do at home. How much do you think you NEED to carry? I posted this same list a while back in a survival forum & recieved no response. This could only be because no one thought the post of any interest or use. For those of us who try hard to interpret the life of our chosen persona, especially if that persona is a woodsman or woodswoman, then this list could be important. When we talk about life in the New World, we are talking SURVIVAL. Real survival. 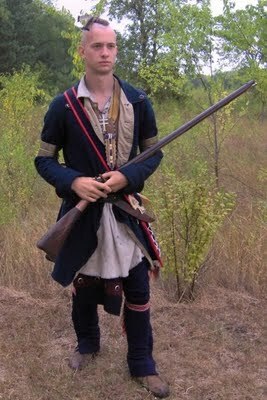 Surviving not only the hazzards that nature can place before us, but also the hazzards of enemy raids, & house invasion. If you relate this to a modern SHTF survival situation you will see the simularity. Now this list, food wise, is for 24 people for just 40 days, just over a month. This is a winter trek but some game will be hunted along the way. A lot of people carry survival foods/trail foods, but just how long will these food supplies last? I think for those of us who are also into long term wilderness survival, it may pay to look at this list & re evaluate your thoughts on just how much food (and other gear) you may need to carry. (Taken from "The New World Woodsman, his clothing, tools & accoutrements." By Keith H. Burgess ). Captain Henry Morgan's Lost Fleet. Video. Their Travels they perform altogether on foot, the fatigue of which they endure to admiration. They make no other provision for their Journey, but their Gun or Bow, to supply them with Food for many hundred miles together. If they carry any Flesh in their marches, they barbicue it, or rather dry it by degrees, at some distance, over the clear Coals of a Wood fire; just as the (haribees are said, to preserve the Bodies of their Kings and Great men from Corruption. Their Sauce to this dry Meat, (if they have any besides a good Stomach) is only a little Bears Oyl, or Oyl of Acorns; which last they force out, by boyling the Acorns in a strong Lye. Sometimes also in their Travels, each man takes with him a pint or quart of Rockahomonie, that is, the finest Indian, Corn, parched, and beaten to powder. When they find their Stomach empty, (and cannot stay for the tedious Cookery of other things,) they put about a spoonful of this into their Mouths, and drink a draught of Water upon it, which stays their Stomachs, and enables them to pursue their Journey without delay. But their main dependence is upon the Game they kill by the way, and the natural Fruits of the Earth. They take no care about Lodging in these Journeys; but content themselves with the shade of a Tree, or a little High Grass. at night, disperse themselves into the Woods, and each takes a several way, that so, the Grass or Leaves being but singly prest, may rise again, and not betray them. For the Indians are very artful in following a track, even where the Impressions are not visible to other People, especially if they have any advantage from the looseness of the Earth, from the stiffness of the Grass, or the stirring of the Leaves, which in the Winter Season lye very thick upon the ground; and likewise afterwards, if they do not happen to be burned. When in their Travels, they meet with any Waters, which are not fordable, they make Canoas of Birch Bark, by slipping it whole off the Tree, in this manner. 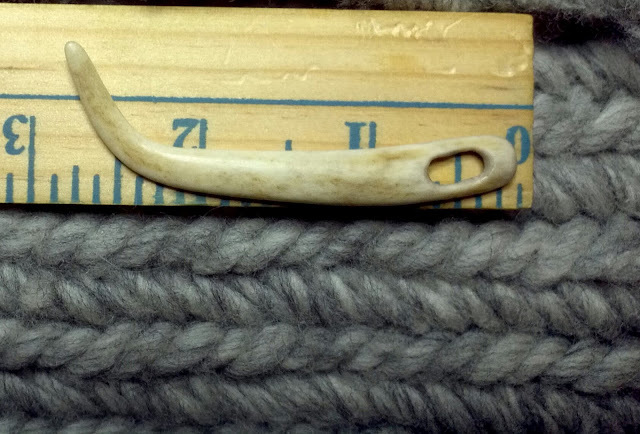 First, they gash the Bark quite round the Tree, at the length they wou'd have the Canoe of, then slit down the length from end to end; when that is done, they with their Tomahawks easily open the Bark, and strip it whole off. Then they force it open with Sticks in the middle, slope the underside of the ends, and sow them up, which helps to keep the Belly open; or if the Birch Trees happen to be small, they sow the Bark of two together; The Seams they dawb with Clay or Mud, and then pass over in these Canoes, by two, three, or more at a time, according as they are in bigness. By reason of the lightness of these Boats, they can easily carry them over Land, if they foresee that they are like to meet with any more Waters, that may impede their March; or else they leave them at the Water-side, making no farther account of them; except it be to repass the same Waters in their return. More on Ranger Trail Foods. with ten of the Rangers, and by 10 o Clock Kill'd More Venison than we Wanted. fresh my Party, & get some Corn of the Indians to Boil with our Venison. Ranger Equipment & Food Rations. Pirate Trader- A Trader's Link. 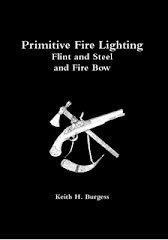 20% Off My Primitive Fire Lighting Book. The Battle of Bushy Run-A Link. The French and Indian War. Video. Protecting The Runner. Last Of The Mohicans.